Panda Express Orange Chicken Recipe is my little sticky sweet and sour secret! This addictive “healthier” fakeout copycat meal is another must try for any serious food lover out there. Spicy, sweet n sour sauce over crispy fried juicy chicken. I show you today how to make this popular and famous Asian-American dish at home with my how to clip further below! Orange Chicken is maybe the most popular Asian-American fast food dish, created by the Panda Express food chain. Boneless Chicken pieces are deep fried crispy and tossed in a spicy sweet and sour orange based sticky sauce. This is what panda express orange chicken is all about! the Orange chicken is then enjoyed with plain rice, fried rice or even chow mein noodles. Turning it into the ultimate comfort meal. While Panda express orange chicken might be seen as junk food to some, I find it to be truly addictive. A real comfort food! Making your own copycat panda express orange chicken is definitely a healthier option too as you decide what ingredients go inside and you know what’s in your meal! This panda express orange chicken is a copycat homemade DIY version so the ingredients might vary from the real panda express chicken. The flavors are but spot on! You can choose to adjust your orange chicken flavors by using variations of ingredients such as regular sugar or palm sugar instead of brown sugar. Yet I don’t suggest to tinker too much with the ingredient amounts (mentioned in the recipe card further below) as these are perfectly balanced that way. 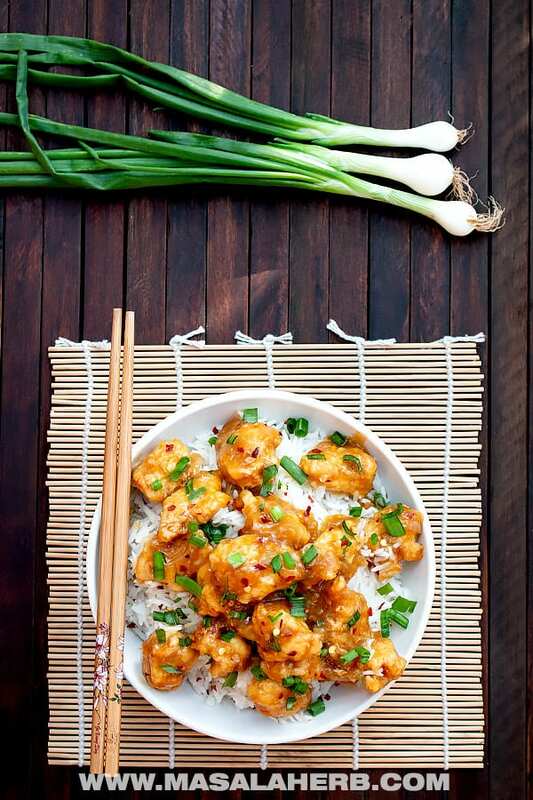 Tip: Add a sprinkle of Chinese five spice to the orange chicken sauce for a little flavor kick of a different kind! You will need the following ingredients to make the orange chicken from scratch. Chili Flakes – adds some heat to your chicken sauce! Orange Zest – use organic orange because of pesticides! One Orange will serve you with the required orange skin and pulpy orange juice. Use an organic/untreated orange which was not sprayed with pesticides as you will be cooking the scraped orange skin. You don’t need to get packet orange juice except if you plan on skipping the orange skin but to achieve the orange chicken flavor you will need the orange skin to make a real copycat panda express orange chicken. For the Ginger and Garlic, you can use convenient Ginger and Garlic paste because it mixes really good with the other sauce ingredients. Or chop your ginger and garlic super fine! Adjust the Chili Flakes amount to make it more or less spicy hot! The Water and Cornflour are mixed together to create a cornmeal slur. This slur is used to thicken the sauce and will give your orange chicken the gorgeous sticky shine. You may skip the cornflour water if you don’t like it but you will have to reduce/cook down the sauce all the more because the sauce needs to be sticky and thick on the crispy fried chicken. Th Rice Wine Vinegar gives the sauce a subtly acidic touch and the Red Chinese cooking Wine (Shaohsing) lends the orange chicken a more Chinese touch to the chicken. 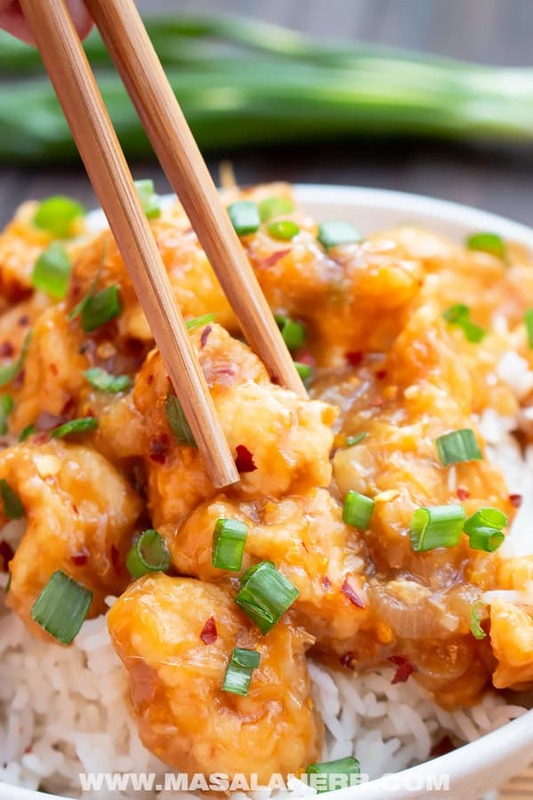 You can use both or skip these two ingredients, however, I never skip them because they both add another incredible flavor dimension to the Panda express orange chicken sauce! Brown Sugar sweetens and turns your orange chicken sticky! You may use regular granulated sugar or even palm sugar. Each would change the flavor of the orange chicken sauce, so this is something to experiment with. The Soy Sauce is another essential in this sauce besides the Sesame Oil. If you don’t have sesame oil, use any other regular oil. Sesame oil gives it the sought-after Asian touch. For the Spring Onions keep the green stalks and the bulbs separate because the green stalks are mild in flavor and make great garnishing material. 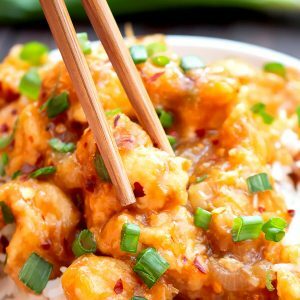 By the way, if you enjoy a good orange chicken, then you are going to love this Honey Chili Chicken Recipe from kitchensanctuary.com. The prepping is similar and the chicken is deep fried as well. Just the sauce in which the chicken is tossed in is a lemongrass honey chili soy-based sauce. 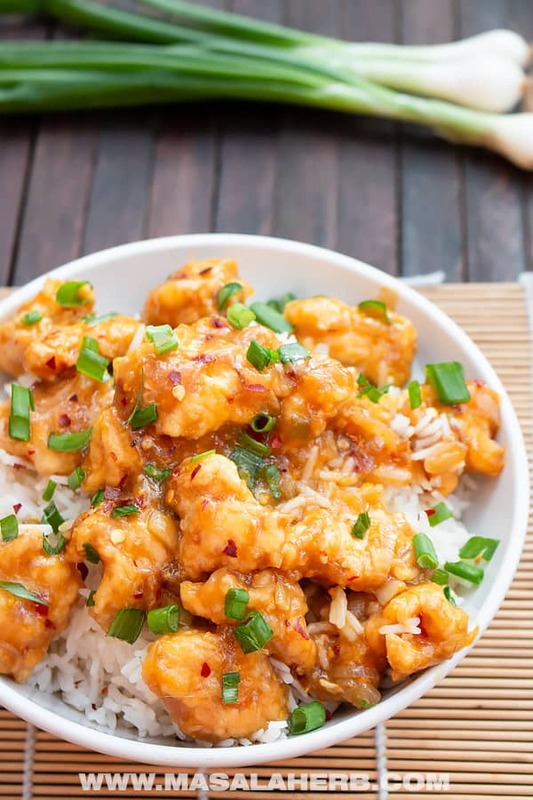 How to make Panda Express Orange Chicken Copycat Recipe? The Panda express orange chicken is separated into two preparation and cooking parts. One is the crispy chicken and the second the orange sauce. As with any Asian deep/stir-fry meal, make sure to keep all your fresh and pantry ingredients ready on the side because Asian cooking requires you to focus on the cooking process. It usually involves high heat cooking for a short time, so having your ingredients on hand is a huge advantage! Start by scraping off the orange skin and juicing the same orange. Keep the skin and juice separated at the side for later. Cut your boneless chicken into smaller bite-sized pieces and keep aside. Now you will coat the chicken with egg and flour. For that keep two bowls, one with the scrambled egg and the other with a mixture of cornflour, all-purpose flour salt, and pepper. Now dredge each chicken piece through the egg first so that the egg coats the chicken properly and then take it through the flour mixture. The egg on the chicken will make the flour stick on it. Do that with all chicken pieces so that they are all properly coated on all sides. Place the coated chicken into a dish until they get fried. Grab another food container/bowl and place kitchen towel paper into it because we will be deep frying the chicken and the excess oil should get absorbed by the kitchen paper towel after having fried the chicken. Keeping it ready will help you in staying focused when you fry the chicken. Then, you need to deep fry the chicken and for that keep oil to heat up in a deep dish. test if the oil is hot enough by adding some dough pieces into the hot oil if it bubbles you can go ahead and slide in your first coated chicken. Or use a food thermometer to determine when the oil is hot enough. The perfect temperature for oil to slide your meat in is 325-350 Fahrenheit/160-175 Celsius. Do not add your chicken to the oil if the oil is not hot! Do not allow the oil to start smoking, that means you have overheated the oil and that’s when the oil can turn bad for your health! 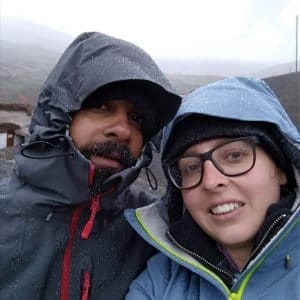 If you are deep drying for the first time read this. Slide your chicken from the sides in so that the oil doesn’t splash up when you add your coated chicken pieces. Add a couple of chicken pieces, don’t overcrowd as this can complicate the cooking. The more you add the more difficult it gets to turn them and the oil won’t be hot enough. Always keep an eye on your chicken in the hot oil! Don’t just walk away or do something else. You need to focus on deep frying only! So that I perfectly cook my chicken, I use something like a deep shallow wok or other Asian wok-like pans. Then I heat up the oil add about 6 pieces of chicken at a time and adjust the heat continuously. When the pan is full, I increase the heat a little bit and reduce it again when I see that it bubbles way too much. The easiest way to deep fry is with a thermometer. You can’t really go wrong with that kitchen tool! Cook your chicken golden crispy and make sure not to overcook the chicken as the meat can lose some of its juiciness. Then keep the cooked meat into the readily kept container with the kitchen paper towel so that the excess oil is soaked up instantly. Cook all your chicken pieces and then let’s move on to your sauce. At this point, I grab a regular frying pan but you can also just empty the wok which you just used to fry the chicken and clean it before using it again to make the orange chicken sauce. Prepare a small sauce by mixing together the orange juice, soy sauce, Chinese red cooking wine, wine vinegar and brown sugar. In another small bowl at the side, briefly mix the cornflour with the warm water. For the Orange Chicken sauce, stir fry the sliced spring onion bulbs in the sesame oil for a minute on high heat. Then add the Ginger Garlic and stir fry on high heat for a moment as well. Continue to add the chili flakes and the orange zest as well and stir-fry. Reduce the heat and add your orange sauce mixture and some water and mix well. Let that cook down for 2-3 minutes or until you feel it got thicker. The Sauce is definitely the easier job here and comes together real quick in the panda express orange chicken. Crispy fried boneless chicken tossed in a hot sweet n sour Asian orange sticky sauce and garnished with fresh spring onion stalk slices. This is the ultimate panda express orange chicken copycat recipe! First, keep all the ingredients ready. That means scrape your orange skin and keep in a bowl. Juice the same orange and keep the juice at the side (with pulp it's great!). Slice your spring onion bulbs, keep aside. Cut your spring onion stalks and keep aside in another container as well. Next, you will prepare the chicken by cutting the boneless chicken into bite-sized pieces. Then keep two bowls or shallow plates ready. Break the egg into one bowl and scramble it. Into the other bowl add the cornflour, all-purpose flour and season with salt and pepper if you want, mix well. Now drag each chicken piece through the egg first and then through the flour mixture so that the chicken is coated and covered on all sides with the flour mixture. Place the chicken into a plate until we fry it and do the same again with all chicken pieces. Keep a bowl or some large container ready and place a paper kitchen towel into it. This will be the container in which we add the fried oily cooked chicken. The paper will absorb the excess oil after frying. To deep fry use a wok because the wok can heat up the oil evenly. Pour enough cooking oil into the wok and heat up. Wait for the oil to get hot. Use a thermometer to check once the oil reaches 325-350 Fahrenheit/160-175 Celsius. Slide your chicken carefully from the side into the hot oil so that the oil doesn't splash up. Don't overcrowd the wok/pan as this will complicate the deep frying. An overcrowded pan reduced the heat of the oil and the chicken won't fry golden but get soggy. Keep about 6 chicken pieces at a time in the pan to deep fry. Cook on all sides golden and take out each chicken piece and place on the paper towel into the container. Repeat this until you have cooked all the chicken. For the orange chicken sauce. Mix in a bowl the following sauce ingredients together: orange juice, soy sauce, brown sugar, red wine vinegar and Chinese red cooking wine. It's ok if the sugar doesn't dissolve, it will dissolve in the pan. In another small bowl mix the warm water with the cornflour to create a cornflour slur which we will need to thicken the sauce. Then reduce the heat and pour in your mixed sauce from the bowl and stir cook for a little until all ingredients are mixed. Let the sauce simmer down for 2-3 minutes or until it has thickened a bit. Next, pour in the cornflour-water mixture slur and mix the whole sauce again and allow the sauce to thicken. The sauce consistency at the end should be sticky and thick. Toss your crispy fried chicken pieces through the sauce so that the chicken is properly covered. Garnish with chopped green spring onion and a drizzle of sesame oil and serve hot over rice or with chow mein noodles. Use boneless chicken breast to make it easier or if you want more flavor use boneless chicken legs. You can skip the rice wine or rice vinegar but both do add a lot of amazing flavors to the dish. Use only an organic/untreated orange for the scraped zest because of pesticides. use the juice from the same orange with the pulp for maximum flavor! Use a thermometer to determine when the oil is hot enough. Don't add the chicken to the oil to fry when the oil is not hot enough or when the oil is smoking. 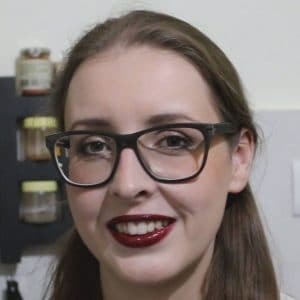 Please read in the post how to deep fry, to gather some tips. You may skip adding the cornflour slur (cornflour+water) to the sauce at the end but cook down your sauce to a sticky consistency instead. How to serve the Panda Express Orange Chicken? Serve while the orange chicken is still hot over plain white rice or fried rice or chow mein noodles. Dear Reader, can you remember when you had your first orange chicken? Thank you for sharing with us. Really awesome. This recipe looks so up my alley! I love making orange chicken, it is the best! Orange chicken is a favorite. I can’t wait to give it a try with some tweaks to make it gluten free!